I know it's been a while since I last updated. I finished yet another semester on my never ending quest to be done withh school. I got the grades I wanted which is good. I took the dreaded OAT. I took it 2 days before Christmas. I think I did pretty good on it especially considering the fact that I only really studied for like 4 days. I have now applied to a few of the schools I was looking at. I will let everyone know when I hear anything. A new semester has started and my classes are going to be tough. This will be a very short post because I have to get uup early tomorrow. Actually this is it. Have a great week! So for those of you who have been living under a rock for the past few weeks and haven't heard what happened, here it is. 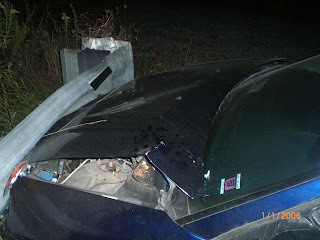 I wrecked my car on a school trip to Grundy Virginia. Everyone in the car was fine. However the car was not. I crashed into a guard rail going around a tight mountain turn. Luckily I hit straight on otherwise it could have been much worse. This all happened on October 3rd. On Oct 22nd was when the insurance company finally got back to me about the decision of whether or not they would fix it. They decided to total it. Lucky for me they are paying off my entire loan of 10,500. So that leaves me without a car payment for the time being. And without a car. I was searching on line and talking to people I know about finding a junker car that will just last me the rest of my time here in VA. I went to a couple of places to look at less expensive cars. I didn't have good feelings about any of them. Yeah I may only spend 2000 on a car but what am I going to spend in repair costs and time without a car in the next year or 2. So I figured it would be too much of a hassle. So here is what I bought. 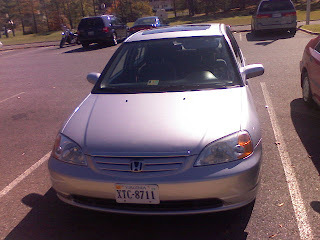 It is a 2003 Honda Civic EX. 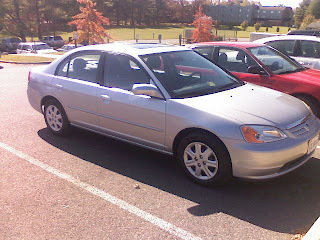 Yes my old car was a 2003 Honda Civic as well. I figured I might as well stick to what I am comfortable with. No thats not the reason I bought it. I got a great deal on it. The car payment I had before was 320 a month and I think I had about another 3 yrs left on it. The new car payment I have is 200 bucks a month for 4 years. So I have a reliable car and a lower payment then before and peace of mind. So all of you who might want to lecture me on making this hasty decision or what some of you may say a stupid decision, I don't want to hear it. I think I made a good decision for me and it is done. So no lectures or snippy coments. Thank you. Well school has started yet again. I will get into that later, first I should tell you hjow my summer went. It was a lot of fun. I finished spanish YIPPEE!!! I am done finito. Once that was finished I decided to take a break from all things scholarly and just relax for a little while. So I figured that I should go to Utah and have some fun out there. For those of you all who know the story just bare with me. Well we went to Lava Hot Springs in Idaho for a few days. It was a blast. Day one was spent getting settled into the cabin and going to the pool. They have some fun waterslides and a huge outdoor swimming pool. The weather was great. I even was brave enough to go off the diving board. (The low one of course. I'm not that stupid.) I even got out my snorkel and mask yes I probably looked like a dork but I had fun doing it so that is all that matters. The next day we got the tubes ready to go down the little river they have going through the town. The first trip down I did great! Didn't fall off once. Was so proud of myself. It went downhill from there though. I fell off I think at least twice in the rest of my travels down the river. Got all cut up and bruised and sunburned. I even lost my hat on one of my wipeouts. I saw it float down the river and I couldn't catch up to it. I thought it was lost for good. But as I was going down I saw a red thing stuck to a rock underwater so I reached for it. It was my hat! I couldn't believe it. I had loads of fun and would do it again in a heartbeat. Maybe I will perfect the technique of staying on the tube so I don't fall off. I also observed an optometrist while I was in Utah. Dr. Pyne the optometrist that Bethany works for was kind enough to let me follow her around for a few days. I learned a ton and am really excited to go to optometry school now. I am still working on my applications. That was one of the things I wanted to get done during the summer but didn't. Oh well. I hope to have them sent in by the beginning of October. I am taking the OAT on Dec 23rd so wish me luck everyone. School this semester is pretty tough so far. I am taking Organic Chemistry, General Biology, Calculus, Creative Writing, and Ceramics. O Chem isn't too bad mostly because the professor rocks. She is really awesome. Biology isnt too bad so far but I will let you know on Monday after my first test what I really think about it. Calculus is just plain hard. I think I am getting it but we will see for sure after the test next Friday. Creative writing is kind of hard. I have always hated writing but I came up with an idea for a short story and did a pretty good job of writing it if I do say so myself. Again we shall see once I get it back as to how well I really did. Ceramics I took for fun because all of the other classes I was taking were so gosh darn hard. So watch out some of you may be getting a Julia original for Christmas. I have asked Bethany to send me some pics of me at Lava so as soon as I get those I will post them. And I will take some pics of my masterpieces as soon as they are finished. Well I have been here in Virginia for over a year now and hope to only be here for one more year. Don't get me wrong I love it here I am just anxious to move on with my life and get on with my schooling and stuff like that. I am starting to get everything together for my optometry school applications. Each school needs different things and wants things submitted in different ways it is driving me crazy! I am applying to 4 schools for sure but maybe up to 14 schools. It all depends on the school requirements. The ones I am definitely applying to are in Boston, Chicago, Indiana and Oregon. I have also started studying for the OAT (Optometry Admissions Test). That seems daunting to me right now. I haven't taken one of the classes yet that I need for this test so the studying is a little bit difficult. I am starting that class this fall and am taking the test around Christmas time. The OAT consists of 195 questions with time limits in each section. So wish me luck with it! So if you read Elizabeths blog you know that I won 2nd place for my yummy chocolate mint chip cookies at the county fair. I am really happy about that. I honestly didn't think I would place at all. Who knew? I am going to Utah next week for vacation. I am so excited. I have been wanting to go all summer and work was going to be letting up so I figured it was a perfect time to go. So I bought my ticket and made arrangements for time off and my boss ok'd it and everything. Then we had an employee quit a couple of days later so it turns out this is a bad time for me to go but I already bought my ticket so there is nothing they can do about it. I am excited to see everyone out there especially my new nephew Tyler! I will start school a week after I get home from Utah. I am taking Organic Chemistry, Calculus, General Biology and an English class. Sounds like fun doesn't it? Oh yeah! I am thinking about taking an EMT class so I can get my Virginia and National certifications but it would basically be just a review of the EMT class I took in Utah so I'm not sure I want to waste my time with it. I will be glad to listen to anybodys opinions about this so I can get an idea as to what to do. Thanks! All these pics are obviously of Xavier and Meredith. They are cuter than I am so hence the pics of them and not me. 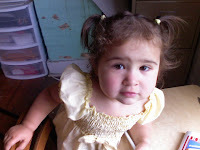 Meredith is officially in her terrible twos and is quite a handful. She gets into EVERYTHING! I swear I have to hunt down stuff in my room everyday because she moved it or was playing with it or was about to open it and spill it all over so Elizabeth or Spencer had to move it to a safe place. You should see my room. I have to have most of my possesions on top of high places so she can't get at them. And Xavier is just getting to the smiling phase. He is sooooooo cute. 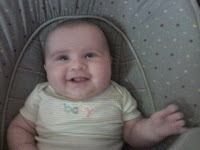 He just coos and smiles at you and then spits up all over you. And his cheeks. Oh! You just want to squeeze them all the time. Well summer has officially arrived here in Virginia. I thought last year was bad well that was nothing compared to what the weather has been like so far this year. Yesterday it was 101 with like 100% humidity. Luckily I had to work in an airconditioned hospital. Oh darn. I am in the midst of my second semester of summer classes. I finished my retake of my spanish 2 class that I failed in the spring. I got an A- the second time around! What a difference a good teacher makes. Right now i am taking my last 2 spanish classes. Yes at the same time. It is very intense but it will be over in 3 weeks and then I never have to take another spanish or foreign language class ever again! I drove up last Thursday for Greg and Le Annas (sorry if I butchered the spelling) wedding. It was a nice drive even though I was by myself and had to do it all by myself. Also I had a momentary panic that I had left my credit card at one of the gas stations but I found it once I got to RI. It took me about 10 hours to get up to RI. I listened to The Divinci Code on CD. That really helped pass the time. It is a great book. It was really great to see everyone. I wish everyone could have been there. But some people had more important things to do you know like go on cruises or work. Lame excuses if you ask me. Well any way. The wedding was beautiful. I don't think I have anything else to say it was just very beautiful. 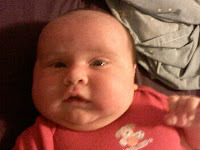 I am glad that LeAnna is now a part of the crazy Kohl family. I wish them good luck (she will need it living with Greg) and much happiness. I wish I had pictures but I don't so I guess I can't post any. I am having so much fun with Meredith and Xavier. I get to be the cool aunt that spoils them rotten and then lets the parents deal with the consequences. He he he! Aren't I evil? They are seriously so cute and a lot of fun. Meredith is a handful like Elizabeth said in her blog. You have to watch her like a hawk otherwise she gets into trouble. But she is so cute so you have a hard time being mad at her for very long. And Xavier I could hold all day if I get the chance. Well recently I was praying that I could somehow get more hours at work because my finances are kind of tight right now and well last week I guess my prayers were answered although I didn't really want them to be answered this way. A coworker of mine got fired and I was asked to fill in for her until they hired someone else. I guess God works in mysterious ways. So I went from working about 16 hours a week to about 40 or so a week. And I'm in school for 5 hours a day too so my life is pretty crazy right now. I may need a vacation after this is all over. I am starting to work on my applications to optometry school and studying for the OAT. Pray that it all goes well for me. 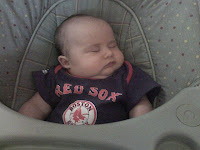 I am hoping to get into the one in Boston. But I am applying to 6 different schools and would be thrilled to get into any of them. I won't know for a while if I get in to any of them. I will post again once they are all in so we can start the acceptance watch. Well class is about to start I better get going. Hope everyone is well. Miss you all. I had a great time on my trip this past weekend. We arrived around 8 pm Friday night and almost immediately hit the sack. We had to get up dark and early the next day at 5 am. We had to be at the school at 6 am to start seeing patients. These people hadn't been seen by a doctor in probably years. Some desperately needed glasses but couldn't afford them. A lot also needed dental work. There were a bunch of dentists and dental assistants that volunteered their time to help all these people. There were also some doctors and some optometrists that helped out. I got to work the machine that measures the curvature of the eye. It was way cool. Bethany gets to use that machine everyday at her job. I am so jealous. Then I got to see the other side of vision care. Remote Area Medical has a lens grinding van that makes the glasses right there. I got to help with that. I must have made about 50 pairs of glasses. I should have pictures soon. I wasnt able to take any pics but some other people did take some so as soon as I get them I will post the pics. Everything else is good. School is almost over. I am excited for summer vacation. So yeah I know I haven't posted in forever. I'm sorry. It's basically been the same old same old for me. School and work keeping me busy. I'm still failing spanish. I'm doing ok in my other classes. Finals are coming up very soon. They shouldnt be too bad. I will just be glad when this semester is done. But then I am taking 2 classes this May so school won't be done for the summer until June. I am going on a trip this weekend to a rural part of Tennessee to volunteer at a big medical clinic type thing. They have them a few times a year in different places to help out with the rural community to provide them with health care. We go and help out where ever we can. Hopefully I will have pictures of it and will post those and the update of the trip when I get back. Well I have a test I have to take soon and a paper to write that is due tomorrow. Yeah I know I should have done it weeks ago yes I am a procrastinator. Going to Southern Virginia University right now studying biology hoping to go to optometry school in the fall of 2009.